Every month, France Bleu Bourgogne radio devotes a complete day to employment by paying special attention to a sector which is creating jobs. 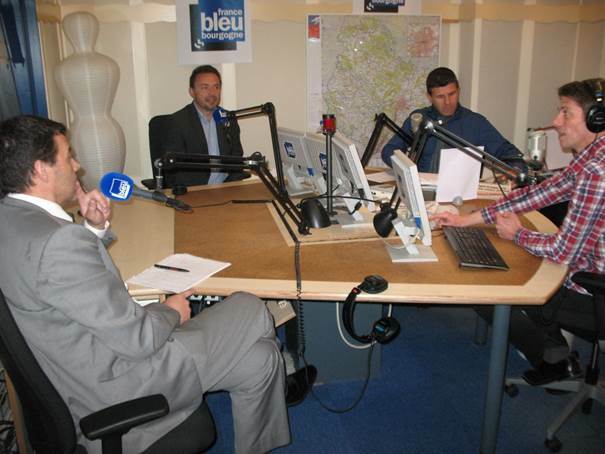 On the 16th of May, the radio station, which covers the Côte-d’Or and Saône-et-Loire departments, devoted its programs for the day to the nuclear sector in Bourgogne, with the theme: “Pôle Nucléaire Bourgogne and France Bleu Bourgogne radio together for employment”. Many of the day’s programs were devoted to the nuclear sector and the jobs it creates in the region, with guests and news reports. In addition, job vacancies in PNB member companies were broadcast throughout the day, and posted on the francebleu website. The day, jointly organised with EDF Bourgogne, was an opportunity to raise awareness of our sector with the general public. Remember that France Bleu Bourgogne radio station is the most popular station in Côte-d’Or, with more than 90 000 listeners every morning! During the programs we placed particular emphasis on the 3 000 new jobs which will be created by our members by 2015 and the problem of finding suitable candidates for some specific posts. First guest speaker at 7.20am, Raphaël Hernandez, who is in charge of EDF Bourgogne’s nuclear industrial policy, laid special emphasis on the links between EDF and the PNB member companies for EDF’s ‘Major Overhaul’ program. At 7.50am, Bertrand Gauvain, managing director of PNB, was the news team’s special guest and spoke about the issue of employment in the sector. His session was followed by a recorded interview with a young engineer recently hired by Areva St Marcel. Between 9.00 and 9.30, Bertrand Gauvain and Raphaël Hernandez were guests of the ‘Experts’ program and answered listeners’ questions about the specific skills sought by PNB and EDF. At the end of the afternoon, Natacha Piot, CEO of Cita Production, was the guest of the women’s program ‘France Bleu vous rapproche au féminin’. This hour-long program mainly discussed the place of women in the nuclear sector and the development of their role. The SFEN Rhône-Ain-Loire region organised a colloquium for young SFEN members from the 11th to the 13th April on the theme of ‘Which energies for the future?’ at ECAM Lyon. The PNB very willingly participated in order to demonstrate its commitment to informing students about the nuclear profession, and to prepare the pool of talent required for tomorrow’s nuclear industry. A tomorrow which will very soon be upon us. The round table on skills required in the nuclear sector, which the PNB took part in, demonstrated the wide range of skills, their contribution to quality and safety, the opportunities available in the French and international markets and the possibilities for future careers in these wide ranging professions. The PNB is already involved in preparing next year’s colloquium which will be held in Dijon in January.